GN high G shaker for water based mud drilling cuttings treatment, have two models for choose. One model is only High G shaker without beneath tank. In this case, the operator should design one cement pit or separate mud tank to hold the liquid part after High G shaker. The other model is High G shaker with beneath tank for fast use. After High G shaker, high speed and variable speed centrifuge will be used for fine solids separation. 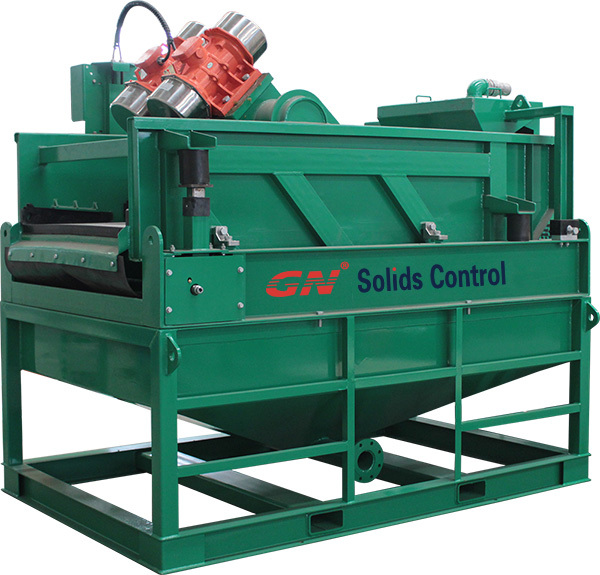 GN Solids Control design decanter centrifuge with height adjustable skid for convenient use. 1) High G shaker with beneath tank: The shaker is GNZS594HGE-LD shaker with 4 panel shaker screen (composite material frame screen and steel frame screen both available). The drying time should be longer than 2 panel or 3 panel shaker, and the performance should be much better. The shaker with hopper type feeding, total height is much lower than weir type feeding or box type feeding, match better with drilling cuttings treatment job. 2) High speed centrifuge with high skid. With this high skid, the centrifuge downside space can be enlarged; screw conveyor can be installed beneath easily to transfer the drilling cuttings / drilling waste discharged from centrifuge to skips. Meanwhile, the high skid centrifuge liquid discharge can be flow back to active mud tank easily by gravity, no need extra mud transfer pumps. With strict government regulations on environmental protection, less mud pit is used to storage drilling waste; on line drilling cuttings management / drilling waste management equipment is mostly used. As per the drilling job condition, some customer may by 2 sets High G shaker and 2 sets decanter centrifuge. 1 set for use; 1 set for backup in case the equipment need daily maintenance.